One of the drawbacks of shooting film, and multiple cameras* at that, is that there can be so much lag time between shooting, finishing the roll, and getting the developed photos back. 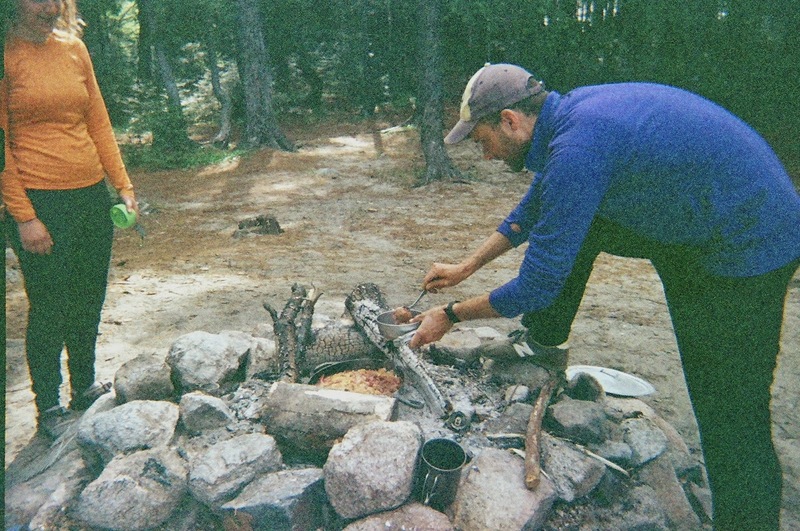 Here it is September and I'm finally sitting down to share some photos, words, and a campfire recipe from a canoe trip back in May. But there are a few weeks of summer yet, so hopefully this will come in handy for your summer and fall camping trip cuisine. 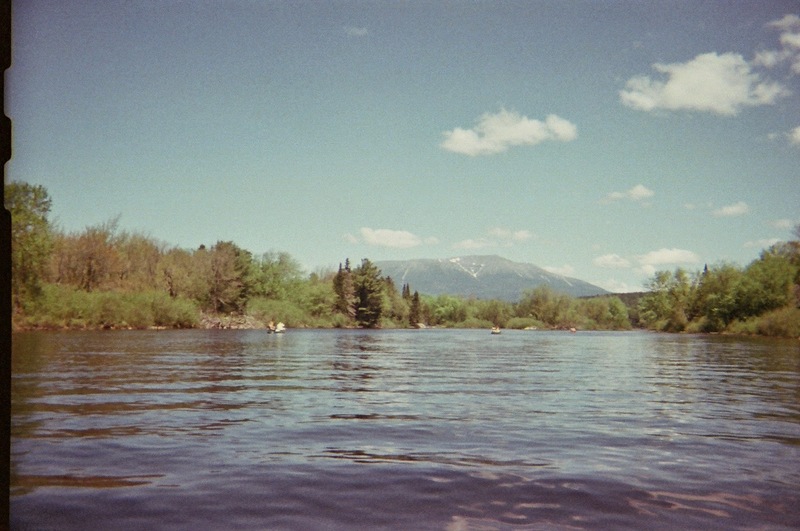 This spring at NELP, I co-lead a canoe trip to the Debsconeag Lakes, just under the shadow of Mt. Katahdin in northern Maine. I jumped on the trip last minute--I thought I'd be leading a "Rough 'n' Tumble New Age Lumberjack Road Trip" to Rangeley, ME, but when not enough students were compelled by the promise of orgone accumulators and chainsaw collections, I joined up with my friend and co-worker James to even out canoe numbers and do a little tracing of Thoreau's footsteps (and paddle "steps") in the Maine woods. Because we were paddling and staying at the same campsite for the three days, we didn't have to be concerned with backpacking weight. So I snagged our skillet from the kitchen and started imagining all the campfire cooking and baking possibilities. 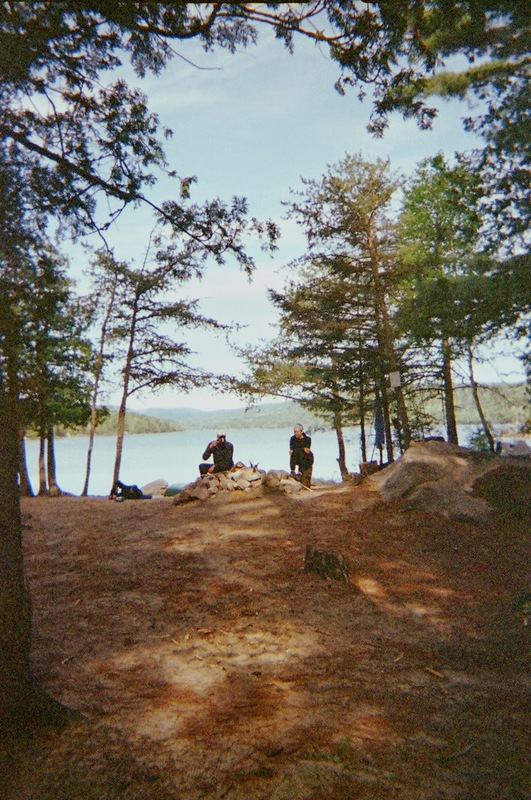 The first day we paddled to our campsite among pine trees on a white beach, set up tents, and then paddled to the other side of the lake which boasts an ice cave along its shores. It was a hot day, especially for May in northern Maine, but when we entered the cave, it felt like we were descending back in time to the cold of winter. Judging from the ice stalactites dripping from the ceiling it was probably just above freezing. That night we took the students out for a night paddle with no lights. It was a magical surrealist experience, seeing the stars almost perfectly reflected in the water (or as Thoreau calls it, "Sky water") which felt strangely thick and dense--like paddling through oil-- but somehow safe and comforting. We read them the passage from Walden in "The Ponds" when Thoreau describes his night fishing, "It seemed as if I might next cast my line upward into the air, as well as downward into this element which was scarcely more dense. Thus I caught two fishes as it were with one hook," and asked them what might be that second fish. 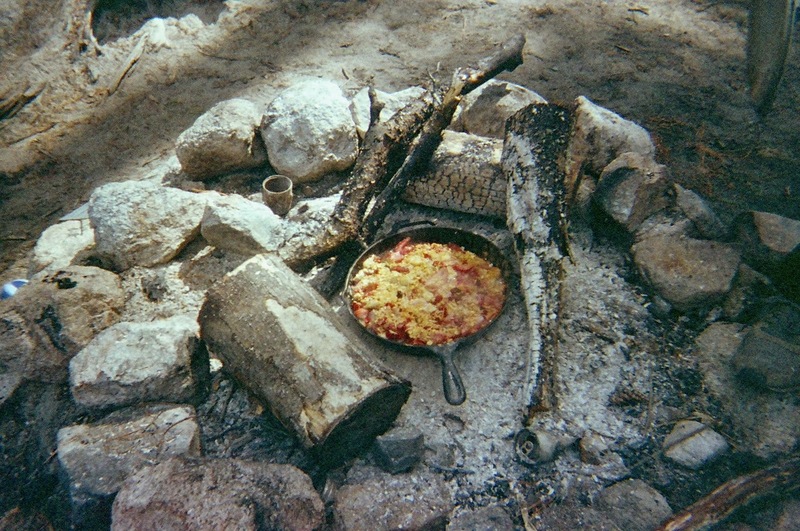 The next morning for breakfast, I sliced up some strawberries and bananas into the skillet, scattered on a flour and sugar mixture I'd prepared back at camp, put on a lid, and stuck it on the hot embers of the fire. After about 25 minutes, we had a breakfast crisp, warm and bubbling, with a buttery, crispy top. You could make this with any fruit you have on hand. I'd recommend mixing the flour mixture at home and storing it in a plastic bag until you're ready to use, then cut in the butter at your campsite (don't forget your pocket knife). It makes a fine camp breakfast or dessert and it fueled our mile-long portage and day of exploring waterfalls and lakes, through a rainstorm and all. 1. In a medium-sized bowl, combine flour, oats, sugars, spices, and salt. If you're preparing the crisp at camp, pour into a gallon-sized ziplock bag and bring along with you (along with butter and fruit.). 2. If preparing at home, preheat oven to 375 degrees F. Cut butter into the flour mixture (if preparing at camp, you can do this with your hands in the ziplock bag). Slice fruit and arrange on the bottom of the skillet. Pour butter and flour mixture over top of fruit. 3. 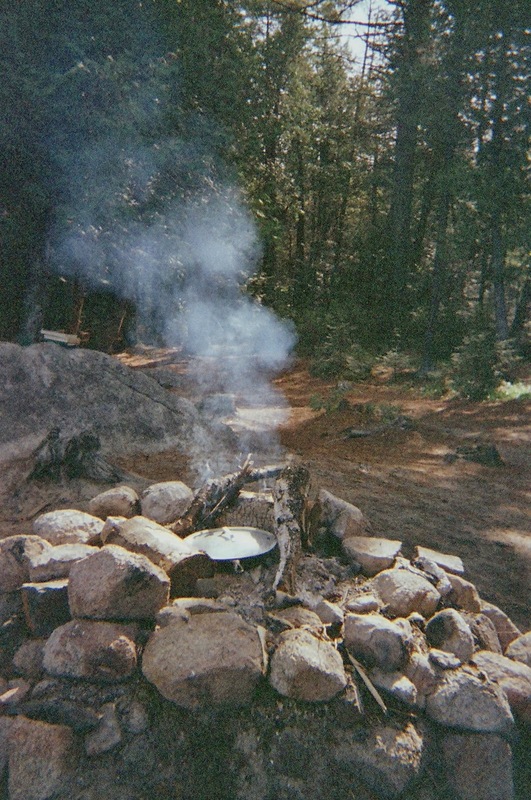 If preparing on a campfire, cover skillet with a lid or tin-foil and place on the hot embers of the fire. If preparing at home, place in the preheated oven uncovered. Bake for 25-30 minutes until fruit is bubbling and topping is golden and crispy. Serve and enjoy! 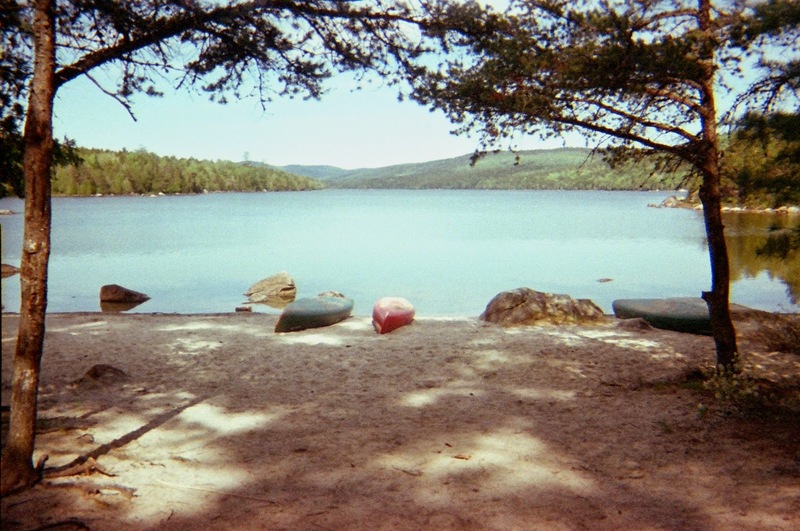 *Camp photos shot on an expired disposable film camera (didn't want my good camera to get wet, so excuse the grainy lo-fi!) and close-up crisp photos shot on my Canon 20D.